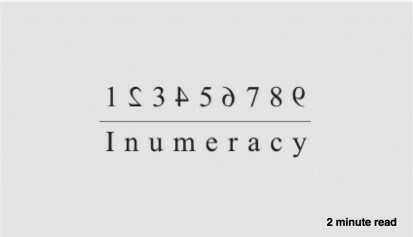 Inumeracy — the numerical version of illiteracy — hurts. It hurts more because unscrupulous parties use it to paint a convincing picture that is at odds with reality. 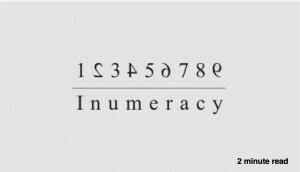 Discourse, opposition, and needed change can all be suppressed by preying on innumeracy. To see this in action, consider the case of Wal-mart back in the spring of 2015. At the time, the inadequacy of the minimum wage was a raging national debate. Fast food workers were organizing a walk out. One after another, corporations were announcing increases in the minumum wages they paid to avoid a social media backlash. As the nation’s largest employer, Wal-Mart was under intense scrutiny. As part of its response, Wal-Mart ran television commercials promoting $1 billion they had committed to skill development and higher wages. One billion, eh? Wow, that’s a pretty big number. Who could deny that Wal-Mart isn’t committed to wage improvement and equality? I could, because when you put the number in context, it’s small. Embarrassingly small (based on figures from a May, 2015 financial report). The $1 billion commitment is 0.7% (seven tenths of 1%) of the $144 billion of Wal-Mart’s net income since 2006. Of the $144 billion net income, an average of 30% has been paid to shareholders in the form of dividends since 2006, or $43.2 billion. The $1 billion commitment is about 2.3% of what shareholders got since 2006. The $1 billion commitment is just a tad over 1% of the $91.4 billion Wal-Mart spent to keep its’ stores and the Bentonville headquarters open. The $1 billion commitment is about one quarter of one percent of the $358 billion Wal-Mart paid for the goods it sold in 2014. Said differently, if Wal-Mart squeezed suppliers for $2.79 on every $1,000 of products purchased, they could permanently add a commitment of $1 billion to their employees. That’s how small the $1 billion commitment is Wal-Mart has made. Further, let’s not enable Wal-Mart’s oily presentation of the facts go unattended either. A billion didn’t go toward wages. Some of it was ‘non cash’ because it went to ‘skill development.’ So, what does that mean? It probably means that the HR staff had a lot more work to do. It also means, I suspect, that if cash component of the commitment was worth bragging about, Wal-Mart would be bragging about it. So, big numbers, like a billion, are well, big. But inumeracy makes them bigger than they really are.